Love Living Locally is Kingborough’s premier sustainable living event – a free community gathering to celebrate living locally in Kingborough. The event attracts up wards of 3000 people on the day and we are thrilled to have over 80 stallholders participating in this years event, including a wide array of local produce and products, sustainable living information and displays, bush and coast care information, entertainment, activities for children and lots of yummy food, drinks and treats. For the science enthusiasts there will be a “Kids Love Science Tent”, with lots of information and activities for curious kids. Liquid Nitrogen Icecream Demos at 10.30 am, 12 noon and 1.30 pm. 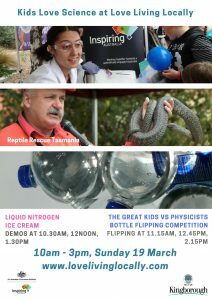 The Great KIDS V. PHYSICISTS Bottle Flipping Competition will be happening at 11.15 am, 12.45 pm and 2.15 pm.